Provia Laboratories is seeking researchers interested in licensing material or collaborating, as well as potential distribution partners for its recently launched library of mesenchymal stem cell research specimens. Provia Laboratories LLC (Provia), a leader in cGMP autologous cell and tissue services, announced the launch of a comprehensive library of stem cell material available for researchers. The library includes ready to ship mesenchymal stem cells (MSCs) from dental pulp (DPSC) found in human third molars or human exfoliated deciduous teeth, as well as from follicular tissue, adipose tissue, placental tissue, and umbilical cord tissue. Provia is currently developing inventory of MSCs from bone marrow, chorionic villi, and amniotic fluid. MSCs are a significant source of stem cells that are known to express important developmental and pluripotency transcription factors such as oct4, sox2, klf4, nanog, and c-myc. Flow cytometric analysis shows that these cells are positive for CD73, CD90, CD105, and negative for CD34 and CD45. Under appropriate culture conditions, MSCs have been shown to differentiate into osteogenic, adipogenic, and chondrogenic cells. MSCs have also been shown under specific published conditions to have neuromuscular and endocrine differentiation capabilities. Based on our current understanding these cells have the potential for use in regenerative medicine - for tissue repair, tissue replacement, and are capable of regulating immune response. 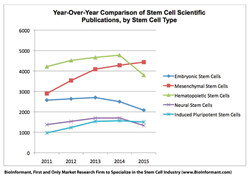 MSCs are currently the most published type of stem cell (BioInformant). Provia offers consumer stem cell banking services such as Store-A-Tooth- the private banking of stem cells found inside baby and wisdom teeth. Additionally, Provia provides commercial biostorage services, as well as a suite of cGMP processing services supporting clinical trials and other clinical activities. However, all cells in Provia’s research library were collected, processed, and preserved under Provia’s separately managed anonymous donor program. Provia’s research library is available for access via direct licensing and/or collaborative research arrangements. Provia is developing a global distribution network. Interested researchers and/or potential distribution partners should inquire at cells(at)provialabs(dot)com. Provia Laboratories, LLC (http://www.provialabs.com) is a life sciences company headquartered in Littleton, MA which specializes in autologous (cells from you, for you) stem cells. Provia provides consumer services such as the ability for families to preserve the mesenchymal stem cells found inside teeth - Store-A-Tooth (http://www.store-a-tooth.com). Store-A-Tooth is offered in dental and oral surgery offices throughout the United States and available through partners in Central American and Singapore. Additionally, Provia offers commercial clients cell processing services, bio storage and related products, as well as cellular research material.